Welcome to the 1st Issue of the ACC Newsletter! Welcome to the new ACC Newsletter, brought to you by the Media & Events Special Projects Team, ACC Staff and hopefully in the future - You! Inside you will find many different features including recipes, puzzles, game reviews and much more. We have tried to include something for everyone and we hope you will ind it entertaining. Most of the content has to do with AC and ACC, but we have also included some from Nintendo. Some of the features will be included in multiple issues and some will just be for one issue. The Newsletter will be released quarterly with the next issue coming out in December. This is where you come in! We would like the community to become involved on numerous possible levels. You could join the Media & Events Special Projects Team to work on every issue, submit an article/content for a specific issue, or just participate in one of our features that catches your fancy! In the PT, please let them know what you are most interested in, as well as some of your ideas. Please see the announcement on the front page of the ACC site posted on 16th August 2017 to see more details about the Media & Events SPT. If you have a particular article, puzzle etc. and would like to submit it to be included in the next Newsletter please see the thread on the Site Suggestions board. If you would like to participate in a feature such as Lottie’s Happy Homes or K.K. Slider ACC’s Amiibo Story, please see the article itself for the details. We really hope you like our efforts on the issue and very much look forward to your ideas and submissions! Looking for that perfect villager? Come on over to Seahorse’s Village Cycling Service and I will help you get that villager! My list is always growing, so feel free to come on over to look to see if I have that special one! 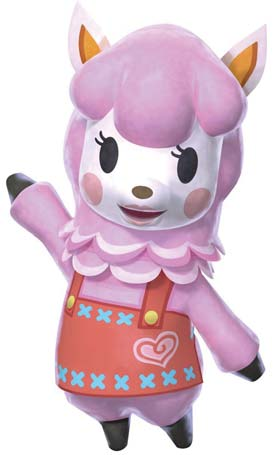 Here at Rosie’s Golden Giveaway, we strive to give every customer the chance to make new friendships and connect to others through our passion of Animal Crossing. 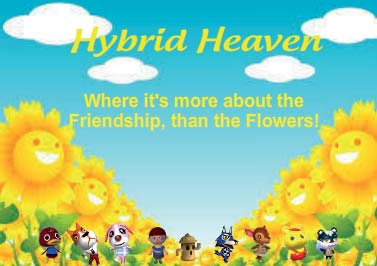 Give us a visit today for all your Animal Crossing needs! Yes! Hello! 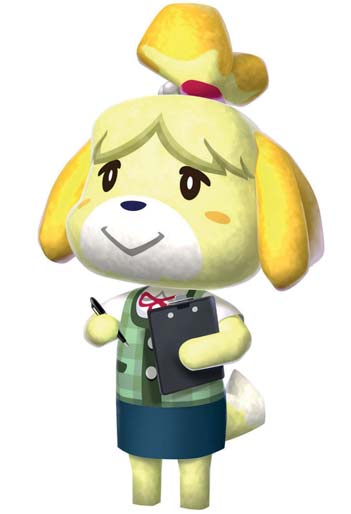 I’m Isabelle, and if you happen to need any help or have any questions, it’s my job to give out advice! This issue I’m answering some of the most common questions people ask me. I hope I can be of assistance! My favourite villager is Bob the cat and I was wondering if there’s any possible way I can get him to move into my New Leaf town. Do you think you could ask him for me? Ooh, Bob? I’ve met him, he seems really nice! Well, there are three ways you can make Bob move into your town. 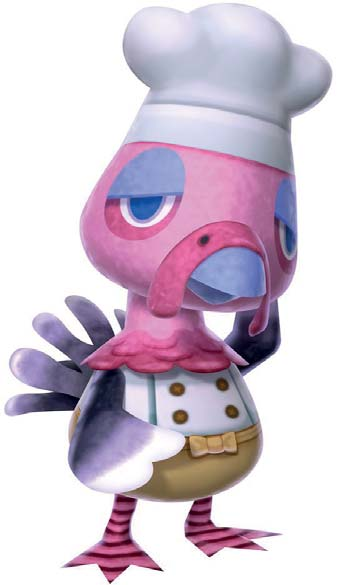 The first way is that you could get really lucky and have him in your campsite (make sure you’ve built it first) and then you could play some games with him in the tent and he might decide to move in. The second way is by going over to someone else’s town where Bob lives and he’s ready to leave. 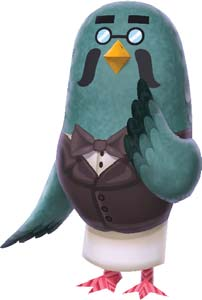 You can talk to him on his moving day when he’s all packed up, and you should be able to suggest your town to him. The third way is to ask Wisp for a little help! 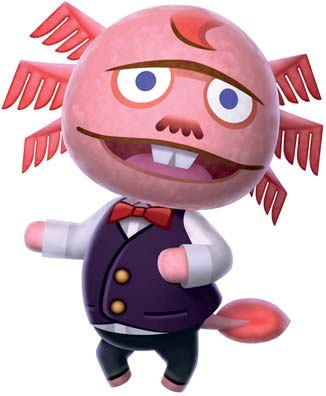 If you have Bob’s Amiibo card – but you have to be playing Animal Crossing New Leaf: Welcome Amiibo – you can scan his card onto your New Nintendo 3/2DS or use an NFC Reader/Writer. Wisp can make him reserve a plot of land in your town the next day and the following day, he’ll be in your town. I recommend going on the AC:NL Villager Trading Board on ACC. There you can make a thread where you can ask for Bob, or maybe ind someone giving him away. There are also some Cycling Services on the Shops and Services Board that might have Bob. Cyclers are people who get villagers quickly moving in and out of their towns so you can visit them and get some moving into yours. Help me, Isabelle! I want to visit other towns in Wild World, but I just keep getting an error message. I really want to upgrade my store to Nookington’s, but I can’t do that unless someone from another town buys something from my shop. What do I do? Oh dear! Well.... unfortunately... there is a small problem. Nintendo no longer allows us to connect to the internet and play online on our Nintendo DSs (or Nintendo Wiis either). This means that you won’t be able to go visiting Wild World towns which are long distances away, under normal means. You can still play with someone who’s up to 20 metres away from you. If you know someone who has a copy of Wild World, you can meet up and use local wireless connections to play in each other’s towns. If you don’t know anybody who has Wild World, why not see if there are any Streetpass or gaming groups in your local area? Maybe someone from the group can help you out. I would love to be on the ACC SPT (Special Projects Team), or the Staff! It would be great to have the opportunity to help you out. How do I go about doing that? Oh, that’s lovely! Well, the Staff are always looking for help somewhere, as there’s a lot of work to be done on the site. There are guides to be written, there are events to be organised, and there are projects to be run! There’s such a lot of stuff. All of this is to help out the members of the site, so if this is something you’re passionate about, you could it right in. If you have a lot of ideas to give – or you’re good at writing guides – you could apply to join an SPT. If you’d be up for monitoring and organising Site Suggestions as well, you could apply to be a Researcher. If you’re good at coding, it might be a good idea to look at joining the Developer Team. Finally, if you’re looking to join the Scouts or the Modmins, you’ll be contacted if the Staff are looking for more to add to the team, have noticed you around the site and think you would do a great job! It’s a good idea to keep an eye on the Site Announcements on the Announcements Board, as there will often be information and details as to when the Staff are looking for members to help. Good luck!! That’s going to be all from me this issue - I hope I’ve been of help! I’ll see you next time answering some more of your questions. Happy gaming, and hope to hear from you soon! Love, Isabelle. Got a question to ask Isabelle you’d like to see featured next issue? PT PuzzlerBird with any suggestions by October 15th. We do regret that not all questions may be answered in the Newsletter, only a selection! Hooooo... WHO?! Oh dear, pardon me! I’m a bit of a night owl, so I feel somewhat drowsy during daytime. Welcome! Please allow me to introduce myself. 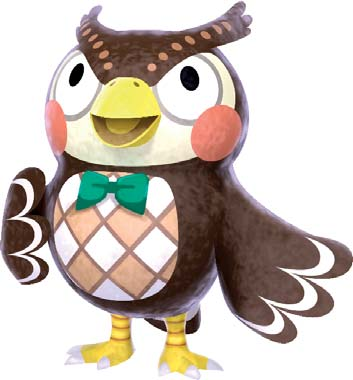 My name is Blathers. I am the curator of the museum. I know all about bugs, fish, deep sea creatures, dinosaurs and art. Hmm. Hoo! How may I be of service? Oh, you’d like to know more about the lovely art and creatures in our exhibits? Hoo hoot! Then how about I tell you a bit more about the Salmon. The Atlantic Salmon, also known by many other names, is an extraordinary fish which, during its life cycle, lives in both fresh water (rivers) and salt water (seas and oceans). Although the numbers of this fish have dropped significantly in some regions, globally the conservation status is “Least Concern”, meaning there are still plenty of fish in the sea! Hoot! Or, at least, plenty of salmon. 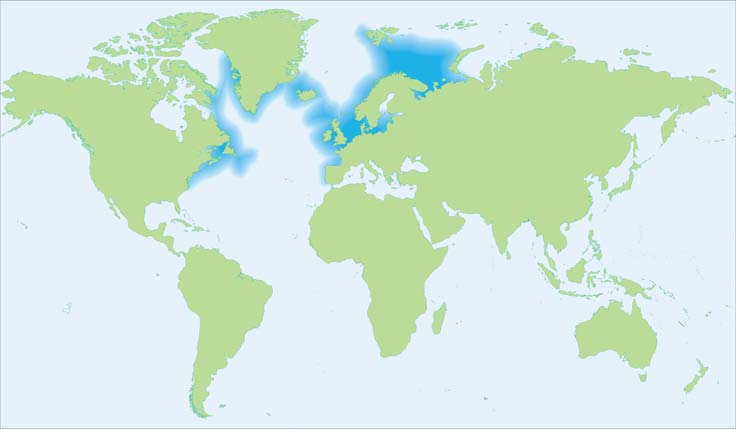 Why don’t you have a look at the dark blue areas on the map, to find out where the Atlantic Salmon lives? The life of a salmon begins in autumn and winter, when eggs are laid on the gravels of rivers. The eggs hatch during the following spring. Depending on the country, it may take between one and seven years before the young fish leave the fresh water, ready to explore the vast Atlantic Ocean. Due to an abundance of available food for the salmon, they grow very quickly during their time spent in these salty waters. In less than a year they will reach adult size. After a minimum of one year spent in the ocean, they will return to the river where they were born. It is not fully understood how salmon manage to find their way back, but it is believed the Earth’s magnetic field as well as the stars play an important role while the salmon are still out in the ocean. When they reach coastal waters, it is believed the salmon navigate based on smell and taste. After reaching their river of birth, they will lay new eggs and most will eventually die. Did you know that the salmon has played an important part in human culture throughout the ages? A carving of a male Atlantic Salmon has been found in a cave in France, dating back as much as 22,000 years! In the work “Natural History” by ancient Roman author Pliny the Elder, the passion of the French for the Atlantic Salmon is mentioned. In Scotland, many rock carvings of the salmon can be found as well. These were made by the Picts between 200AD and 700AD. More recently, in the North Pacific, people used the water resistant salmon skin to make bags, parkas, mittens, boots and other items of clothing. Oh dear, looks like I went on a bit of a tangent! Hoot! I hope you’ve enjoyed learning about the “King of Fish”. Please let me know if I can be of further assistance. I will tell you a bit about something from our other exhibits in the next issue. For now, please enjoy your visit! The salmon can be caught all day long, at the river mouth, however only during September. It has a fairly long shadow and can be sold to Re-Tail for 700 Bells. When you catch one, you’ll think it’s slammin’, and the fish is usually around 36 inches long. They are popular migratory fish that are born in rivers, migrate to oceans, and return in four years. In Japan, flavoured salmon eggs are a very popular dish called Ikura, but it hasn’t caught on in the US. In rare cases, salmon will only stay in the ocean for one or two years before coming back. These fish are known as “phantom salmon” since they’re so hard to find in the wild. Their characteristic pink colour comes from the prawns and krill they get in their diet. If they ate differently, their flesh would be white. So what is it like to be a Site Manager, and to work so closely with the community? We catch up with Jarikira, who is ACC’s Community Liaison. You can approach her at any time with issues relating to ACC to be brought up by the Staff as required - big or small. 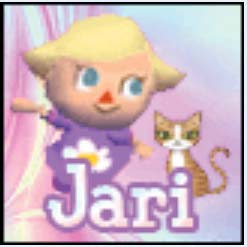 So, without further ado, here’s Jari! Hi Jari! Thanks for doing this interview with us. Can you tell us a little bit about yourself, and how you came to be on ACC? I have been a member of ACC since 2010. I found ACC when I started my first town which was on the game Wild World. I didn’t know anyone at that time that played the game and I wanted to visit someone’s town. I googled WW Friend Codes and up popped ACC. I’m lucky enough to live very close to Jader, the owner of ACC so ACC time is the same as my own. I remember joining and thinking this is awesome - look at all these people. Then I got a PT from a Giveaway and I was hooked! They are going to give me free stuff! Yeah, that’s the great thing about ACC, we’re such a big community and there are lots of people helping each other out everywhere! Have you worked with Giveaways a great deal? Yes, I joined a Giveaway as an employee as soon as someone would hire me. I’ve worked at least one Giveaway ever since. I truly think the Giveaway/Shops/Services Community is one of the best aspects of ACC. People volunteering their time and effort to help other people with their AC game. I agree. The services are certainly a big part of what makes ACC. What do you do outside of ACC? And in your avatar, you have a picture of a cat. Do you have a cat at home? Offline, I worked at a hospital for 34 years until I had a health crisis and was unable to work full-time anymore. I work part-time now and volunteer a lot of time at my church and a local cat shelter near my home. I love animals and I’ve had cats and dogs all my life. I have had cats only for about the last 15 years though. My username came from the combination of my name and my cat at the time, Kira. The cat in my Avatar was Miller who I had then. My current furbaby is Link - no explanation there I guess! That’s interesting! What else do you like to do in your spare time? Besides working with cats, I enjoy video games, reading, making jewelry, cross-stitch, and quilting. I also spend a lot of time with my 5 grandchildren, ages 6 months to 13 years. The 13 year old boy and I are especially close as we play video games together so much. He’s much better than me though! That sounds super fun. You sound like such a cool grandma!! Meanwhile on ACC, you’re currently the Community Liaison, what does that involve? I was invited to become a Community Liaison at the end of 2013. It has been a rather fluid position as the need changes as the site does but the most important aspect, in my opinion, has stayed the same. I function as a bridge between the Community and the Staff members as needed. When we have Staff discussions, it is my job to not only bring up my opinion but also whatever questions or impact the discussion might have for the Community. When any questions, opinions, suggestions or comments are brought to me by the members I take those to the appropriate Staff and answer back as needed. And of course, keeping up to date with any and all PTs I have received from the members. A very important job. What other work is required of a Site Manager? Some of my other functions are regularly reading threads on the Site Suggestion and Site Support boards, posting on those as needed, reading all the Staff boards, posting on those as needed (especially as how they might affect the members) and bringing issues from the community to the attention of the Staff. It is also important that I try and think like a member and bring that to any and all discussions. Besides the Site Suggestion and Site Support boards, I monitor as many public boards as I possibly can just to try and keep current with which ones are being used the most and what directions the community seem to be going in currently. The position actually dovetails very closely with my previous work as a Mod and my current one as an Operations Administrator. Everyone is itching to know, Jari... what was it like being invited to be an Admin? How did it feel? And how different is it from being a Moderator? I can still remember seeing that PT from Jader. I was absolutely floored and stared at it for a minute, trying to absorb it before I could even click on it. It had never occurred to me that I would be considered for the role of Site Manager/Admin. I was incredibly flattered and to be totally honest a little scared I wouldn’t be able to do everything needed. This site has been a big part of my life for over 7 years and I would never want to disappoint anyone here. It has been quite a lot of work to try and learn everything I need to know. Thankfully, Iolite, Jader and the other Staff have been very patient and helpful through the process. I still don’t have everything down pat and still make mistakes - I just spelled Pokémon wrong in the Poll this week for example - but I try my best. The hardest part so far has been trying to be everywhere needed at once. There is so much more that can be done than I could have imagined. I can imagine. It’s been absolutely fantastic chatting to you Jari. Thank you so much! Just one last thing... you’re stranded on a desert island... what three items do you take? As for the deserted island, my glasses, my cat and a really long book! Enjoyed finding out more about Jari? Want to ask some more questions? Post your questions in the Ask The Staff sticky on the Site Suggestions board and Jari can respond for you! Don’t miss next issue where we interview another staff member and find out what their role involves. We’re asking you to send in your letters, to feature on a dedicated page. To send in a letter to the Pelicans, PT PuzzlerBird before November 15th. 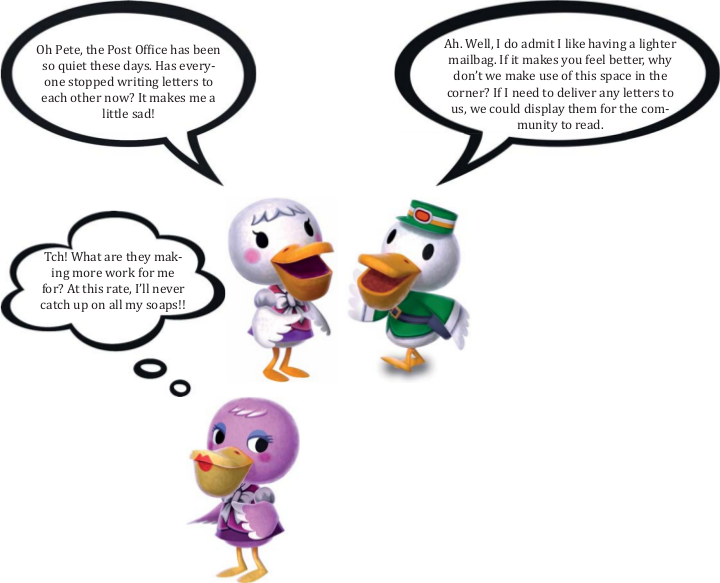 We ask that you keep your letters no longer than a few sentences, and ACC or AC related. We regret that we may not be able to feature every letter sent in. Hey there! I’m the guy they all call Franklin. I’ve been whippin’ up a whole bunch of dishes with delicious fresh ingredients to create new menus which satisfy all kinds of palates. This issue I’ve got a rooty soup, a hearty main dish and some irresistible cakes to finish off. Mmm.. gobble gob! Remember, if you’re new to the kitchen always ask an adult to help you! Have you chopped up all the veggies? Let’s get cooking! Fry the onions with some oil in a large pan that can also be used for boiling (a wok also works well) until soft. Add the chilli(es), spices, the root vegetables, a little more oil and cook for a few more minutes. Add the stock mixture, the milk, and the yoghurt. Bring the mixture to the boil and then turn the heat down until the point where bubbles are just starting to form. Cook on this heat for about half an hour. 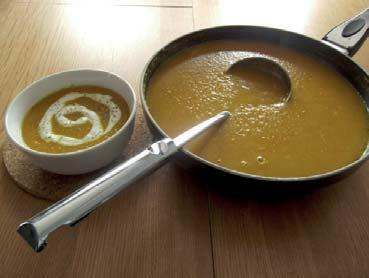 Use a hand blender (or pour the mixture into a blender) and whiz until the soup is the consistency you like it. Serve and enjoy! Made too much soup? You can freeze portions for up to 3 months and then re-heat them. Why not try sweet potato or yam in place of the potatoes, or add in a tin of beans after the blending stage? Don’t have any vegetable stock? Try marmite stock instead! Simply dissolve 20g of yeast extract into 1 litre of boiling water. It adds B vitamins, folic acid and a savoury twang to your soup. Got everything you need? Let’s get cooking! Slice all of the potatoes thinly (a few millimetres will do it). Finely chop the onion. When you’re done chopping, turn on your oven to 200°C/400°F. Add enough oil to cover the pan, and place on a medium heat. 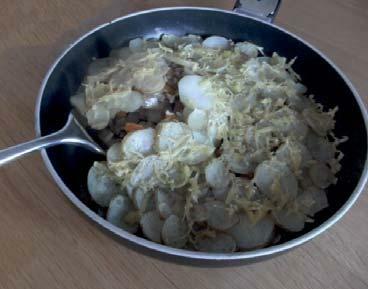 Place half of the potatoes in the bottom of the pan and cook for a few minutes. Add the minced meat or soya mince, and the chopped onion. Continue to cook for a few more minutes. Add the vegetables and spread them out over the pan. Layer the remaining half of the potatoes on top and turn off the heat. Sprinkle over some sea salt and black pepper (if you like) and grate over the cheese (if you’re using it). Put the pan in the oven for 20-30 minutes, or until the potatoes on top are starting to look like they’re getting crispy. If you’re using the eggs, make sure to start cooking them in a frying pan about 5 minutes before you take the pan out of the oven. This dish is great if you have any vegetables left over in your fridge that you don’t know what to do with or you don’t want to just put them in a pasta. It’s also a great way to get kids to eat their veggies and their potato skins! If you’re cooking for a gluten-free vegetarian, check the ingredients in the meat-free mince you are using (some brands can contain barley). This one’s super easy! Put the oven onto 180°C / 350°F. Just sieve the flour, baking powder, salt, cocoa powder (if you’re using it), and sugar into a large bowl. You may need to push some of the sugar through the sieve as brown sugar tends to have some lumps. Keep a few small handfuls of chocolate bits aside. Stir the mixture, make a well in the middle, and then add the liquid (milk, oil and vanilla) and the chocolate bits. Stir the lot and spoon into 12 muffin cases. Sprinkle the chocolate bits you kept aside on top and put into the oven. When the muffins have been in for about 15 minutes, they should be done (they’ll spring up if you press them down lightly). You can enjoy them hot, but they’re best served when they’re cold and squishy! If you happen to have any left over, you can freeze the muffins for about 3 months. If you put them in an airtight box, they’ll be good for 3-4 days at the most. Making vanilla dough? You can swap 100ml of the milk for 100g of vanilla yoghurt. 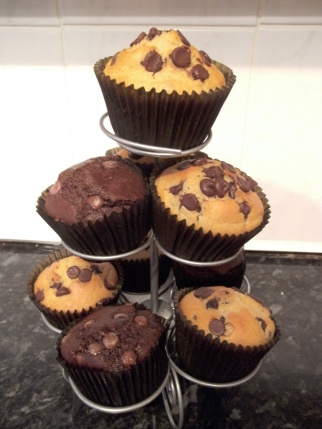 The muffins will stay squishy and moist and adds more vanilla without overpowering the flavour. Need to cook for someone with a special diet? Want to try a dish from another country? Ask Franklin to have a go at whipping up something for you! 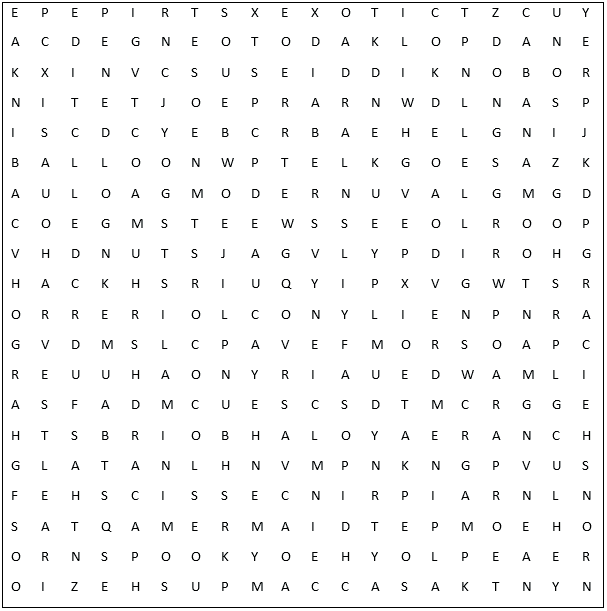 PT PuzzlerBird with any suggestions before October 15th. 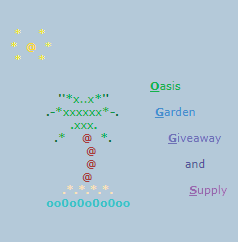 Oasis is a garden themed service offering a Giveaway, Shop, prize related game and a monthly raffle. We try to make it easy for customers to get all of the gardening supplies they want/need from one service and also offer bulk ordering to achieve that goal as well. In addition to gardening items, we also have custom items and custom promos available for order. We try make sure our customers receive the best possible service we can offer, and provide items our customers love using their feedback and suggestions. As the longest running Giveaway on ACC, we offer our Customers a Professional, Friendly & Fast service always. From Fruits to Furniture, or Landscaping of your town. We have all your New Leaf needs covered. Come visit us today on our Giveaway, Landscape & Shopping threads. What happens when you mix a third-person shooter with Nintendo? You get an odd, but addicting game of squids versus octolings. Releasing just a short 2 years after its predecessor, Splatoon 2 brings the vibrant and fast-paced shooter series to Nintendo’s new hit console, the Nintendo Switch. For those who missed Splatoon on the Wii U (and we don’t blame you if you did), this series brings a new type of shooter genre to the Nintendo Switch. In Splatoon 2 you battle by spreading/shooting ink, rather than the normal grenades and bullets. You also have the ability to turn into a squid at your heart’s content. 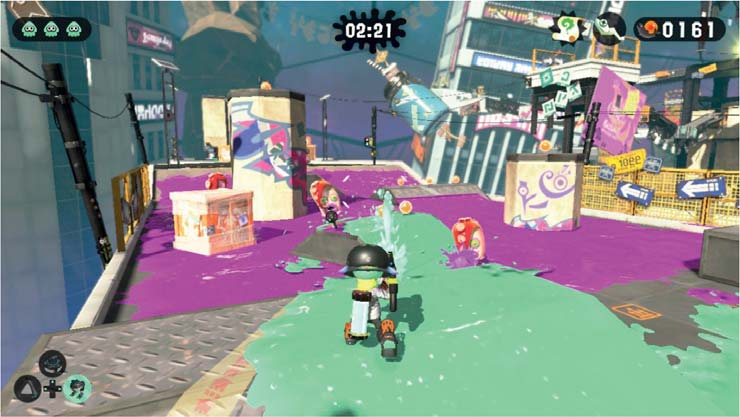 Doing so allows you to swim through your ink faster in comparison to walking in inkling form. This ability of transforming between squid and kid is something you’ll be glad you can do as it allows you to climb ink-covered walls, fall through metal grates, and sneak up on enemies. This brings up the real question though, are you a kid or a squid? 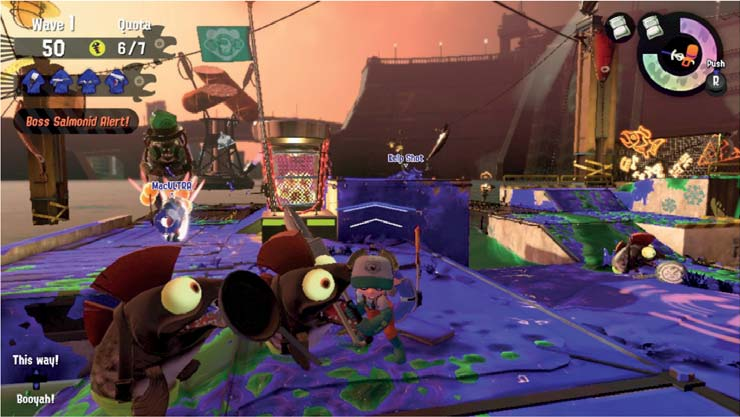 In the multiplayer mode “Turf War”, you compete against another team of 4 to cover the most turf by spraying your ink with various weapons. When the time is up, the game calculates which team covered the most turf and a winner is declared. Most often it’s a back and forth battle between the two teams, as the middle grounds of the map become a wet, goopy, yet beautiful war zone. I’ve found myself more addicted to this mode than ever before. It truly is endless fun. You also have plenty of options to spread your ink around. In Sheldon’s weapon shop (Ammo Knights), you can choose between a variety of unique and bizarre weapons. There are classic Shooters which are easy to pick up and get the hang of, but there are also more strange weapons like Rollers, Sloshers and all new to this game, Brellas (it’s literally an umbrella gun ... cool?). Each weapon also comes with a unique sub-weapon and special power. Finding the correct combination for you can take some time however. There are also three other shops that allow you to pick up the freshest clothing in town. Check out all the choices, as what you wear affects how you play! Like the original, Splatoon 2 also includes various other multiplayer modes, with a new addition that didn’t appear in the original game. Rank Battles (which includes Splatzones, Tower Control, and Rainmaker) all make a return in this game. You can also play in League Battles once you obtain a B- ranking (and let me tell you, this isn’t always easy). These modes are much more intense than Turf War. If you get stuck with even one bad teammate, it could cost you the match (as this has happened to me multiple times, and it’s very frustrating). The new multiplayer addition to this game is Salmon Run, which is this game’s version of a horde mode. Here, you and three other are cast off to fight waves of enemies that will do anything to see you splatted. Every new wave the game changes and the players obtain a new weapon, and a new round of enemies appear. It’s your job to collect as many Golden Eggs as possible. If your entire team is splatted, or you fail to meet your egg quote for the wave, then it’s game over. There have been countless times where my team failed because someone was not working with the team in mind. So be sure to work together like your life depends on it, because ... it does! Though this mode is a ton of fun, it sadly is only available to be played on predetermined time slots, which is a disappointment. Most notably known for its multiplayer modes, Splatoon 2 builds off of its predecessor to create a more interesting, and overall larger single player campaign. This mode has you working with Marie (the pop super star from the first game) trying to find her other half, Callie, who has gone missing. The single player mode is separated into 5 “worlds”, each with their own secrets to find. Every level isn’t unlocked from the beginning either, you have to search each world for the next level, which makes each world feel more alive and exciting to adventure. Though, sometimes I did find myself getting frustrated when I couldn’t find the last level in a world. Each level is unique, and a blast to play through over and over again. I won’t spoil anything, but the final boss is something you won’t want to miss. On a more detail-oriented note, the visuals of this game are absolutely gorgeous. Running in 1080p / 60fps, Splatoon has never looked more sharp. Along with the stunning visuals is the one-of-a-kind soundtrack, which includes some catchy, bubbly tunes. You can tell a lot of time has been put into creating the 90’s atmosphere of this game, as it is pulled off perfectly. The one huge downside to this game though, has to be some of the online issues. Players still can’t team up with their friends and remain on the same team without creating a private match. Players have to download an app to be able to have voice chat with your friends. Players can only play on two predetermined maps every 2 hours. Some of these issues have been around since the first game as well, so it’s confusing as to why Nintendo still can’t get its grasp around online gaming. Hopefully with Nintendo charging (only $20 may I add) for online services starting in 2018, these issues will be resolved in future games and maybe even patched in Splatoon 2. Only time will tell. For those of you who were around for the Wii U game, you’ll notice that Splatoon 2 isn’t a total reimagining of the third-person shooter genre like the original game was. Rather this game builds off of its predecessor in the right areas by adding new weapons, stages, modes, and fixing issues from the irst game. The Splatoon series has never been fresher as it makes its debut on the Nintendo Switch. If you can find a Nintendo Switch (because we know how hard they are to get), we highly recommend this game. 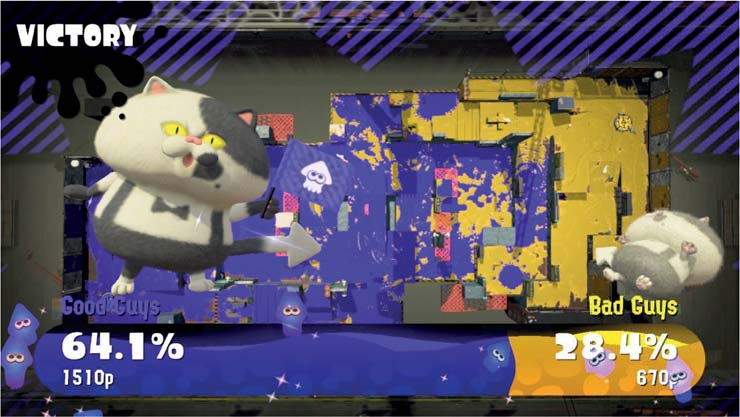 That’s why we are awarding Splatoon 2 an 85/100. Animal Crossing: Coming to a Phone near you! Remember that one time when Nintendo said they were going to start developing mobile apps? Over the past year and a half, the company has been delivering on that promise. We’ve seen a social media app (Miitomo), a fulfillment of all of our childhood dreams (Pokémon Go), a more traditional side-scroller (Super Mario Run), an RPG (Fire Emblem Heroes), and... well, whatever Magikarp Jump is. And there aren’t any signs that Nintendo’s going to hop off the mobile app train anytime soon. You may or may not know by now that Nintendo plans on releasing an Animal Crossing mobile app. If you’re the type of person who enjoys reading newsletters made by the staff of a small Animal Crossing fan website, you’re probably excited by that news. Lucky for you, Reggie Fils-Aimé (the president of Nintendo of America) has said that we’ll get the game by the end of 2017—and for those of you who haven’t looked at a calendar lately, 2017 only has four months left. So what can we expect to see from this game? Since it’s probably going to be free or very inexpensive, we might get something like Happy Home Designer: a video game based on Animal Crossing that focuses on a certain feature within the series. There’s almost certainly going to be some sort of interaction with villagers, because what’s an Animal Crossing game if it doesn’t have that? And we can expect in-app purchases, a common feature among mobile games that Nintendo has been using since Miitomo. Since I don’t have some super cool inside knowledge about Nintendo, all I can really do is speculate about this game and what it means for the Animal Crossing series. Perhaps this game will be used to market the fabled Animal Crossing Switch. Maybe I’m looking into this too much and Nintendo just thinks that an Animal Crossing mobile app would be profitable in its own right. All I can say for sure is that it’s going to be hard for me to be productive once that game hits the app store. I walked through the flea market the other day and I tell you, I was itching to get out of there! I finally caught my first bee yesterday, I was buzzing! It’s weird how some people pick their noses, isn’t it? I was just given mine! 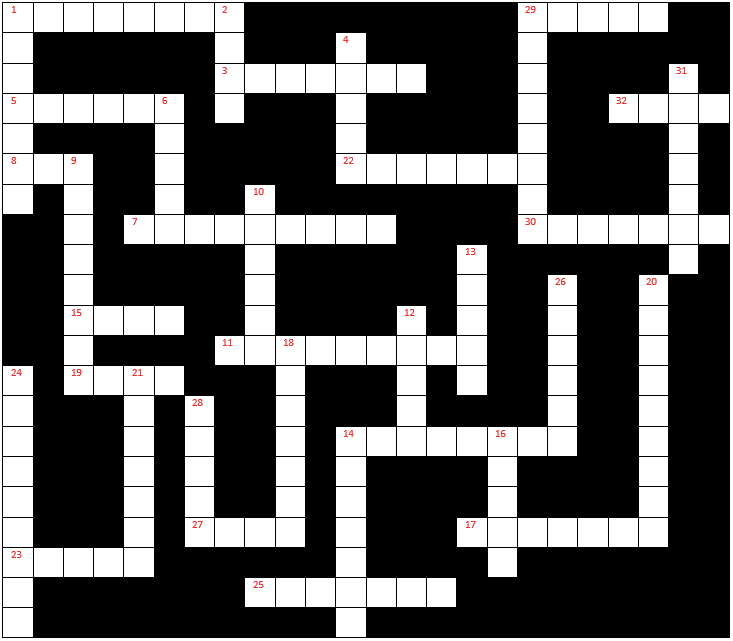 The answers to the puzzles will be available in the next issue, so keep a look out for it! Hey man, my name is Totakeke but you probably know me as K.K. Slider. I’m part of ACC’s Amiibo Story, which is a special part of the Newsletter where my other Amiibo friends and I share some of our rad experiences and ask questions to the members of ACC! Today, I’m just relaxing at home playing some of my favourite tunes and I’m trying to decide which Animal Crossing game I like best. I’ve gone from being down on my very last bell to being a rockin’ DJ! 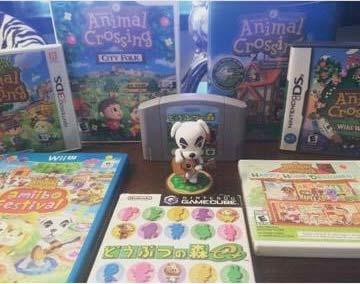 Why don’t you help me out and post which is your favourite Animal Crossing game here on this thread, along with your favourite K.K. song? Do you dig it? I’ll be waiting for those responses, you might even get a response back! Are you looking for your dreamy villager? Perhaps you have many dreamy villagers! No worries, you have come to the right spot! Stop by our thread and order yours today. Thank you! Riesz’s Free Pieces is usually only open from 12-4pm on Saturdays, when new lists go up. However, you can expect quick and friendly service. The rules may be confusing and daunting, but don’t worry about making mistakes. This giveaway is stocked with donations, mainly unorderable items, so the lists change every week! First come, first served! Stop by our thread today! Hi there, Tiger! My name is Lottie! 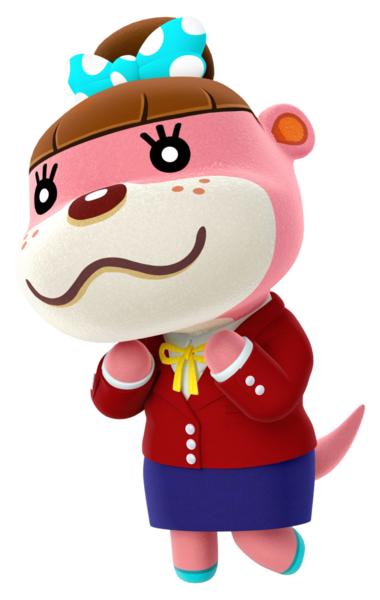 You may have worked with me before at Nook’s Homes if you have a copy of Animal Crossing: Happy Home Designer! 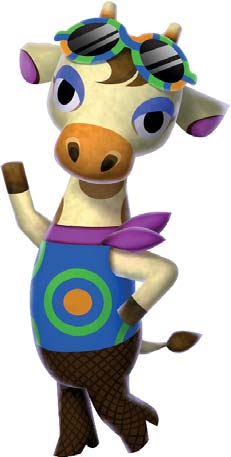 If we haven’t met before, you might be familiar with my uncle Lyle from the Happy Home Academy, or my boss, Tom Nook. Here at Nook’s Homes, it is my duty to work with customers to design their dream home, however I’ve been so busy recently that I’m behind on my schedule and I could really use some help. If you think you’ve got what it takes to be a Happy Home Designer, I’d love to have you on board! I could really use the extra paws... or hands, in your case! Oops! I’d really appreciate the support, and as a reward, your home design will feature here in the ACC Newsletter, along with some other cool prizes, including a neat badge for your ACC profile. Please remember, I am only looking for one room to be designed, so there is no need to redecorate your entire house! You may use any version of Animal Crossing to create and design your room. It’s up to you, Tiger! Today, I am looking for a home for the outdoorsy type! Please ensure that your ACC Username is the subject of the email. You may only enter once, and all entries must be made by November the 1st. Any entries made after this time will not be counted, sorry! Winners will be announced in the next issue of the ACC Newsletter. That’s all for this issue! We would like to thank the ACC Staff and the Media & Events Special Projects Team, without whose efforts this first issue would not have been possible. We sincerely hope you’ve enjoyed reading everything! Please look forward to the second Newsletter, due in December 2017.